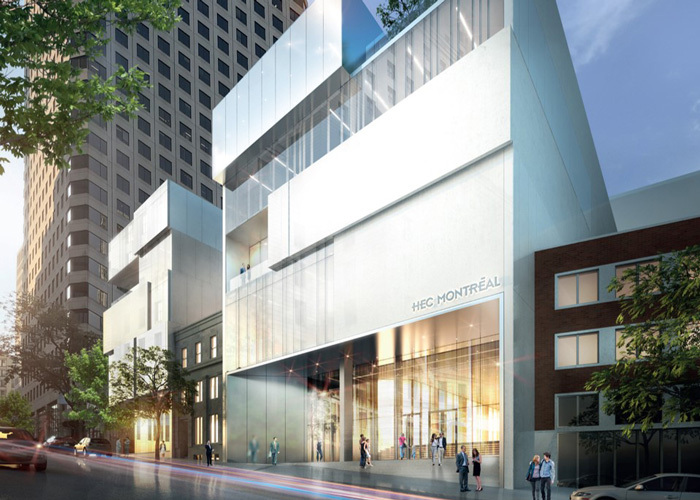 HEC Montréal has received Cabinet approval for its proposed new building in the business district, on the site next to St. Patrick's Basilica. The official announcement was made at the School on May 24th by the Honourable Hélène David, Minister of Higher Education and Minister responsible for the Status of Women, and by the Honourable Dominique Anglade, Deputy Premier and Minister of Economy, Science and Innovation and Minister responsible for the Digital Strategy. The Quebec government has confirmed that it will be investing $93.5 million in the new building, out of a total estimated cost of $183.1 million. “HEC Montréal has earned a stellar reputation. The School is an excellent drawing card for Montréal, attracting and training students from all over the world, many of whom will go on to be agents of change in Quebec and throughout Canada. This financial assistance will let HEC Montréal continue its teaching and research missions and offer facilities better adapted to its clientele,” said Minister David. The new building, needed given the serious shortage of space at the School, will also be an opportunity to bring HEC Montréal physically closer to the business community at a key time in its history, as fast-moving technological developments are creating both a tremendous demand for training and the need to closely harmonize the labour market and advanced research, particularly in data science and artificial intelligence. The School’s new presence in the downtown business district will also let it better serve its clientele, since the courses and programs to be offered in the new building are aimed specifically at practising professionals: the School’s MBA programs, certain specialized graduate diplomas and certificates, and training through Executive Education HEC Montréal. The building is to open when students return to classes in fall 2021. “I’m delighted to know that the School’s new proximity to the business community will improve access for professionals, executives and entrepreneurs to the expertise developed at HEC Montréal,” said Hélène Desmarais, Chair of the HEC Montréal Board of Directors. “The new building in the heart of the city’s business district is sure to add new vitality to our relations and partnerships with businesses and public organizations. But above all it will be a guarantee of success in this age of digital transformations, when we all have to innovate and rethink the way we do things,” added HEC Montréal Director Michel Patry. The users of the new building will focus on incubating innovations, co-creation and accelerating start-ups every day. For instance, it will be home to CDL-Montréal, a creative destruction lab program for supporting scientific start-ups with significant growth potential in the start-up phase, along with facilities for the National Bank | HEC Montréal Entrepreneurship Institute and Tech3Lab. Several HEC Montréal departments will also be moving there, including the HEC Montréal Foundation, Alumni HEC Montréal and Career Management Services. Today’s announcement comes as the result of years of planning and preparations, starting with identifying the most appropriate site and then working with the different stakeholders (Quebec City, Montréal, representatives of the St. Patrick parish Fabrique, and neighbours) to ensure that the project fits into the community and its surroundings as seamlessly as possible, with respect for local heritage. Many experts were consulted in this regard, including Héritage Montréal, the Conseil du patrimoine culturel du Québec and the Ministère de la Culture et des Communications. The new HEC Montréal building will incorporate cutting-edge practices, standards and technologies, to create a work, study and social environment that is stimulating, welcoming and open to the entire community. For more information, visit the Proposed New Building in the Downtown Business District Web page.